When an ice storm struck Puget Sound last winter, knocking out power for several days, Emily and Michael Rogers found themselves in the same boat as their neighbors, except for one notable difference: They use motorized wheelchairs. Without power, they faced being stranded. Michael decided to approach their neighbor, Mary, across the street. “He came over and said they could sure use some warm food,” Mary said, explaining that she had a generator. It turns out Mary had more than that. She had an idea and a strong desire to help the whole neighborhood prepare for future emergencies. Over the next several months, she secured a location, set a date, and organized an evening of emergency preparedness resources, supplies and information. The Emily Project was born. One of the Emily Project display tables. Mary and Emily visited their neighbors and dropped off flyers to the first meeting. Along the way, they discovered that their neighborhood had a lot of natural resources: people with skills and knowledge. “We found out we have a couple nurses,” Emily said. “And a carpenter.” They also met some elderly neighbors who could use help in an emergency. Without any training or guidance, they were doing naturally what Map Your Neighborhood does in a more formal way, which is to connect neighbors with each other and prepare to handle an emergency in the hours (and sometimes, days) before first responders arrive. 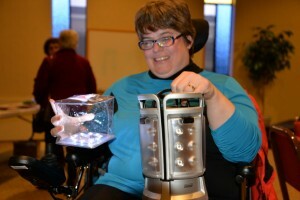 Emily compares her old, heavy portable light with a new inflatable lighted cube that attaches to the back of her wheelchair. 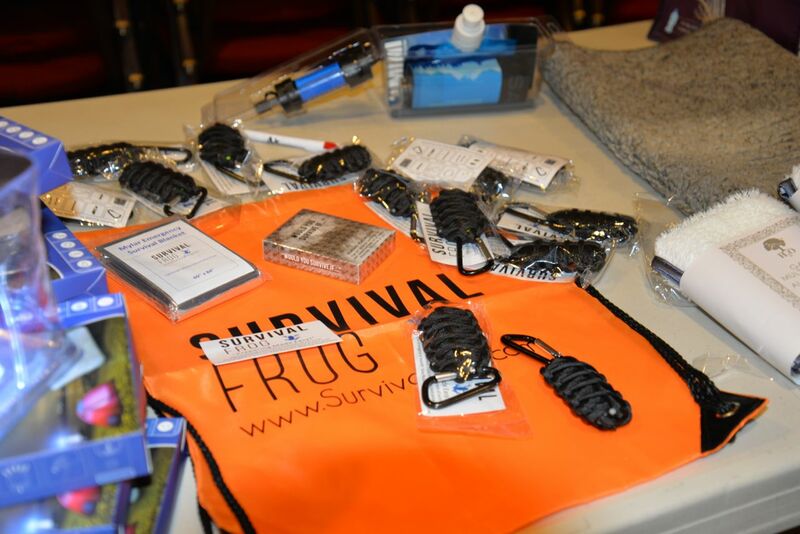 The Emily Project’s first gathering boasted a roomful of tables filled with products—everything from water purifiers and dehydrated food to inflatable cube lights and backpacks filled with easy to find and inexpensive survival items. There were a lot of helpful people too, like Wayne and Dawn, who offered tips on how to start a fire with oil from a can of tuna, and how to create a plan to connect with family members separated during a disaster. The local fire department was also there to answer questions and show support. As part of their own preparedness plan, Emily called her local fire department to ask about the best kind of smoke detectors to install. While she was on the phone, she let them know that she and her husband use power wheelchairs. The fire department entered their information into the system so that if something happens at their address, an onscreen display will show that they use power wheelchairs. Emily learned there are things that first responders can bring and do to accommodate their needs if they know them ahead of time.